If you’re looking for heavy work activities kids, this collection of ideas is suitable for children of all ages and abilities. I used to think the term ‘heavy work’ meant nothing more than lifting heavy items and transporting them from point A to point B, but when I started digging deeper into the world of special needs parenting, I learned a ton of helpful information about the proprioceptive system and how heavy work activities can benefit children with sensory processing disorder, autism, and other developmental delays and challenges. Read on for a deeper look into heavy work activities and how they can benefit children and adults alike! Simply put, ‘heavy work’ refers to activities that push and pull the body. Kids of all ages and abilities can benefit from engaging in heavy work, but these activities are particularly helpful to children with sensory processing disorder as they engage the proprioceptive system. What Are the Benefits of Heavy Work Activities? 1) Helps calm and organize the nervous system. Since heavy work activities help calm and organize the nervous system, they can help lower feelings of stress and anxiety. Heavy work activities can also help reduce aggressive behaviors, improve self-regulation, and reduce proprioceptive seeking behaviors like excessive chewing. 2) Improves body awareness. Children with proprioception dysfunction have difficulty understanding where they are in relation to the space around their bodies, which can impact their ability to sit, stand, stretch, bend over, climb stairs, run, etc. Heavy work activities help improve this awareness, thereby making these activities easier. Heavy work activities also help reduce proprioceptive seeking and avoiding behaviors. 3) Promotes greater focus and attention. The calming effects of heavy work activities have the added bonus of improving a child’s ability to sit still and concentrate. Scheduling regular ‘brain breaks’ throughout the day is important for kids and adults alike, and if your child struggles with things like focus, hyperactivity, and/or impulsivity, this small change in your daily routine can be extremely beneficial. 4) Improves muscle tone. Kids with sensory processing disorder (and autism) tend to have low muscle tone, resulting in challenges with strength, flexibility, and endurance. Heavy work activities can help strengthen these muscles and skills. Before we share our favorite heavy work activities for kids with sensory processing disorder, it’s important to note that not all children can tolerate them in the same way. An activity that is calming to one child can cause another to become over-stimulated, so you may need to play around with a few different ideas before you settle on a list of heavy work activities that works best. One of the best ways to help children with developmental delays and challenges is to find activities that feel like play instead of practice, and this collection of heavy work activities is designed to do exactly that! As mentioned above, it’s important to be mindful of how your child reacts to each activity – the things one child finds calming may have the opposite effect on another child. 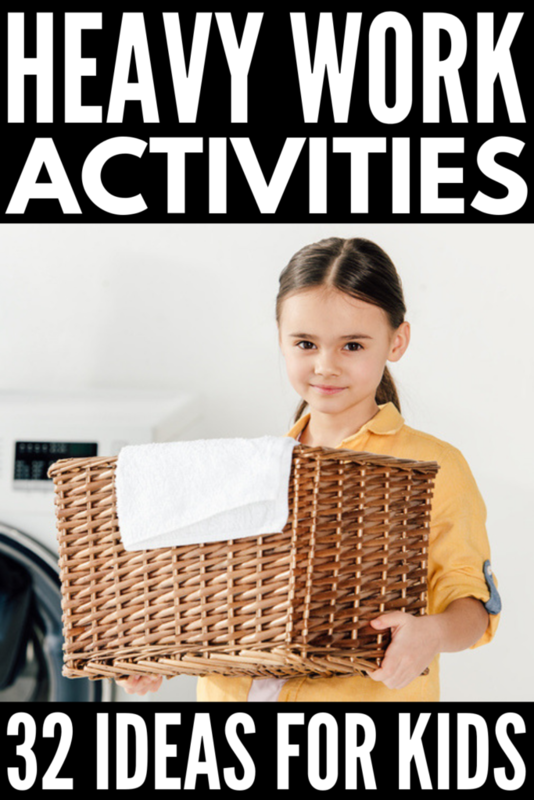 You’ll notice that many of these activities offer age-appropriate ways to get your little one to help out around the house. A little responsibility can go a long way in making a child feel as though they are a contributing part of the family, which subsequently helps to build their self-esteem and self-confidence, making these activities a win for everyone! Wrapping your child snuggly in a blanket and pretending she’s a burrito! Challenging your kids to a friendly game of Tug of War! *Make sure to follow directions when ordering weighted products to ensure the weight is correct for your child’s age and size. For safety reasons, your child must be able to remove the item from his or her body independently. I hope this collection of heavy work activities for kids inspires you find creative ways to help your child with body awareness, organization, self-regulation, attention, and focus. Remember to try several different ideas to find the activities that work best for your child’s challenges, and to keep things fun and engaging so it feels less like practice and more like play! If your like this collection of heavy work activities, please share this post on Pinterest! And if you’re looking for more tips and ideas to help kids with developmental delays like autism and sensory processing disorder, please follow our Special Needs Parenting board where we share all kinds of helpful ideas we find each day!